BroadSound continues to amaze audiences with its world-class vocalists and musicians. Broadsound's chemistry is second to none. Their energy and stage presence are contagious leaving long lasting memories from each event. 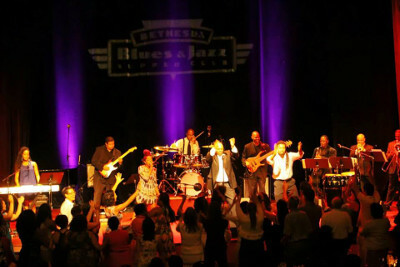 Members of BroadSound have shared the stage with artists such as Ray Charles, Al Jarreau, Aretha Franklin, Patti LeBelle, David Foster, Melissa Manchester, George Duke, Stephanie Mills, Eric Roberson, Hugh Masekela, Common, Kirk Whalum and Lalah Hathaway. BroadSound is simply amazing!! BroadSound performs as a 10 piece band consisting of keyboards, bass, drums, guitar, 3 lead vocalists (2 males and one female) and 3 horn players (Trumpet, Saxophone and Trombone). The keyboardist and drummer also sing adding an additional female and male vocalist. One male vocalist doubles on percussion and the other on trumpet. BroadSound is also available for smaller events as an 8 piece band (with Saxophone only), providing a variety of music ranging from current top 40 hits of today, to Big Band Jazz, Latin and classic oldies. Whether it’s a wedding, corporate event or anniversary, BroadSound is the perfect choice.